Located along the Hudson River, the River Club apartment development in Edgewater, New Jersey, consists of seven low-rise multi-family rental buildings constructed in or around 1997. Over the years the buildings have experienced leakage and degradation of the building enclosure systems and structural framing. While those issues have been fixed using temporary patches, the client also wants to update the appearance of the complex. The existing exterior design of the complex was dated even before it was completed, so it is in dire need of a refreshing. In addition the area around it has seen a lot of new multi-family residential development, that has begun to compete with the apartment’s ability to attract new tenants. The current facade enclosure systems include; brick masonry veneer walls, exterior insulation finish systems (EIFS), inset balconies with sliding glass doors and punched windows. 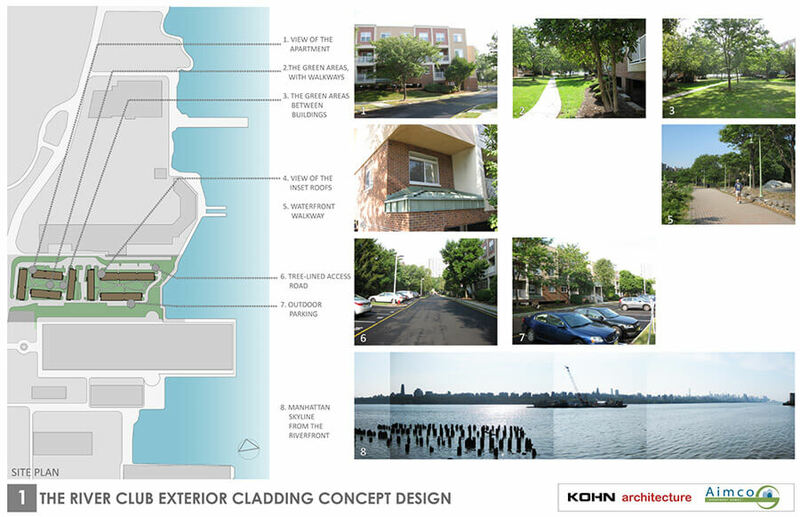 The buildings’ structural system is a combination of concrete and steel framing for the below-grade garage portion and conventional wood framing for the upper floors.Kohn Architecture, registered with the American Institute of Architects, is a New York City Architecture firm. Our firm was hired for our expertise in design and exterior repair architectural services to develop a facade recladding scheme for the entire complex. Currently the owner is in the process of evaluating the costs and has not yet decided to move forward on the project. 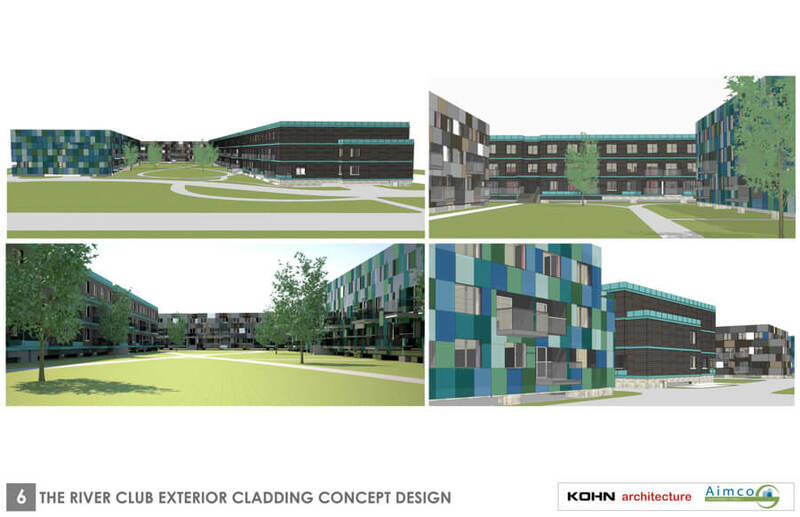 Kohn Architecture is still involved in the project. Before the current complex was built, the Edgewater area along the Hudson was a combination of old decaying shipping piers, warehouses and industrial uses. More recently as the area has experienced increased residential development, a planted river walk was built that winds its way through existing older gritty warehouses, vestiges of piers and stone rip rap along the shore. 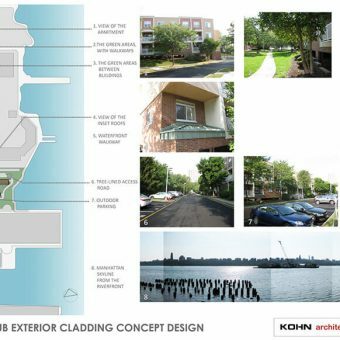 Drawing on the proximity to the river, the new and old elements, colors and materials found in and around the site, Kohn Architecture developed a palette to link the new design to its existing site. 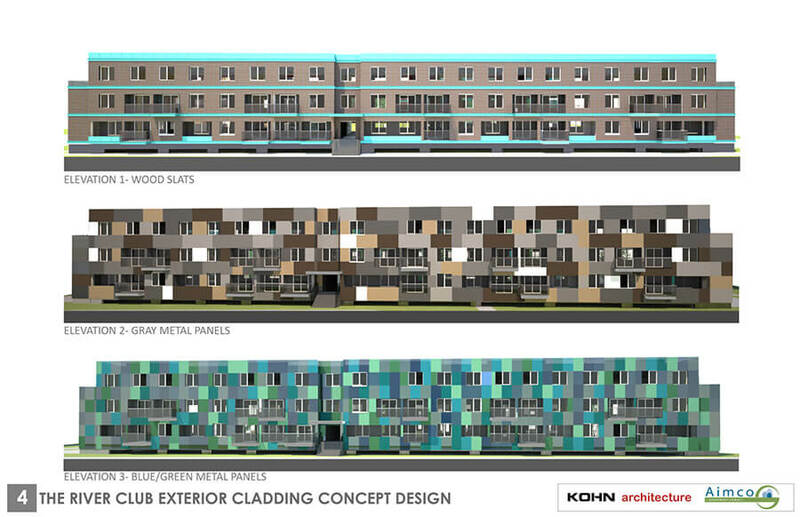 3 distinct panel designs were developed for recladding the buildings. 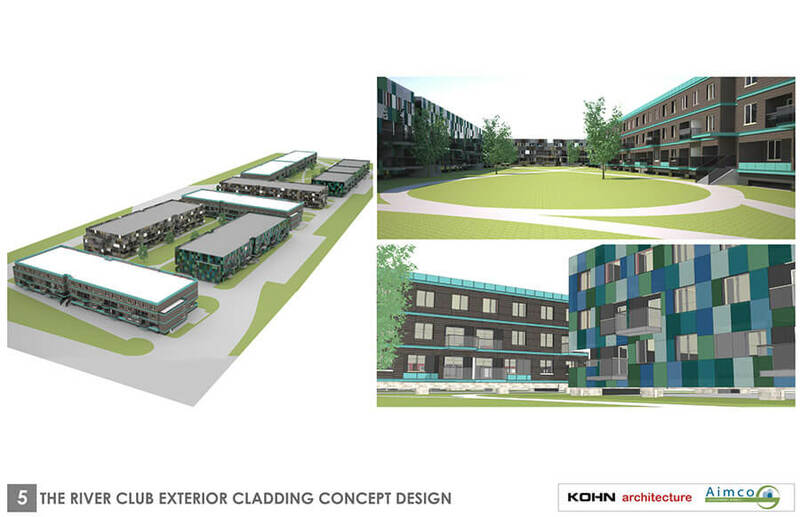 Two of the designs will be all metal, and one will be a combination of wood composite and metal panels. The lower parking garage level will be re-skinned in cast concrete panels and large planters will be inserted into existing niches that are currently not being utilized. Because there are seven separate buildings, the panel designs will be alternated so that no two buildings directly facing each other will have the same pattern. The new cladding will incorporate a rain screen system that allows moisture to drain behind and then out of the wall. The prior EIFS system was poorly designed, trapped moisture and contributed to the leaks and deterioration that has affected these buildings. The different panel designs will utilize the same structural backup framing system. A hygrothermal analysis will be performed to determine the one-dimensional heat and moisture transport effect on the wall system in order to evaluate the potential for moisture accumulation and condensation, and assist with the design of these systems, including selection of membrane, vapor retarder, and insulation components. In order to install the new panels, first the existing EIFS system skin will be completely removed and a new panel support and rain screen backup system will be installed over the existing framing. 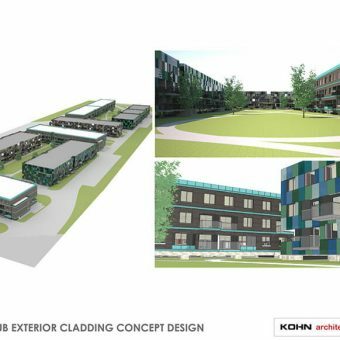 Contributing to the new facade scheme, new cantilevered glass entry canopies, entrance storefront design, and railings have been designed that will replace the old existing building elements. 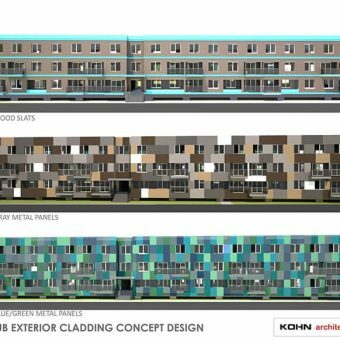 To provide variety and to create a more 3 dimensional facade appearance, some of the current recessed balconies will be extended out beyond the existing building plane. The current white plastic clad railings will be replaced with tinted glass railings to match the color scheme of the various panel combinations. In addition to the aesthetic upgrades, and because as-built drawings of the complex do not exist, the building will be surveyed using 3D Laser Scanning utilizing state of the art 3D scanning equipment to perform multiple scans for the exterior of the building. This integrated data will be used to extract vertical and horizontal elevation information from and to generate 2D & 3D Plans and profile surveys utilizing AutoCAD Civil 3D. 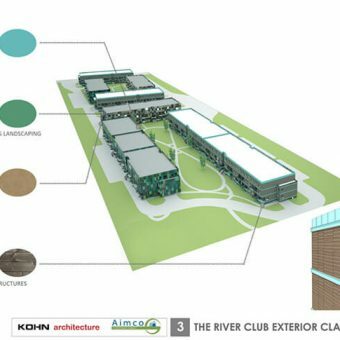 Additionally as part of the services for this project, Kohn will oversee and coordinate structural and mechanical engineers, and facade and waterproofing consultants for the building enclosure elements, such as; rainscreen cladding support framing and fenestration products such as windows and doors. An extensive Full-Building Energy code modeling analysis will also be performed in order to bring the buildings envelopes up to today’s current energy code standards. 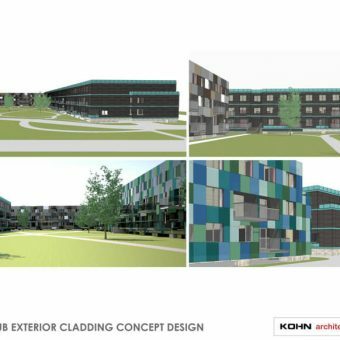 As part of the overall project scope, Kohn will prepare a new Zoning Analysis to be prepared and submitted to the Planning Board as well as Department of Buildings filings. Finally a façade inspection, safety and repair plan will be performed and implemented that will include the following: Windows, doors, steel lintels, balconies, roof perimeters, replacement of damaged wood framing, settlement issues and brick replacement.